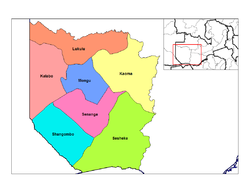 The geography of the province is dominated by the Barotse Floodplain of the Zambezi river, extending from the confluence of the Zambezi with the Lungwebungu and Kabompo Rivers at the northern border of the province, to a point below Senanga and above the Ngonye Falls in the south. This floodplain is inundated from December to June, and is fed by other rivers with their own floodplains, and serves as a vast reservoir storing the waters of the Zambezi. The seasonal flooding is very important to agriculture in the province, providing natural irrigation for the grasslands on which huge herds of cattle depend, and bringing water to the settlements along the edges of the plain. Away from the Zambezi and its tributaries, much of the landscape is a gently undulating series of fossil sand dunes from a previous extension of the Kalahari Desert, with numerous lagoons, pans and seasonal swamps in hollows between the dunes. Dry grassland plains, teak forest, miombo woodlands and patches of evergreen Cryptosepalum forest cover the land. Mongu is now well supplied with paved roads and drainage . The main one and the chief access for the province is the 610-kilometre Lusaka-Mongu road or Great West Road, which in the past has been poorly maintained but has recently been resurfaced. There is an ambitious regional plan to provide the first ever major link between the road networks of Zambia and Angola via a Barotse Floodplain causeway from Mongu to Kalabo with a bridge over the Zambezi, replacing the current dry-season ferry at Sandaula. A paved highway would then be built north-west to the Angolan border continuing to Lumbala N'guimbo and Cuito Cuanavale. Although the causeway and bridge from the Mongu Kalobo Road has since been completed by the PF Government. In November 2007 unpaved earth causeways were in place from Mongu to beyond Lealui and Sandaula to Kalabo, but bridge construction had not commenced. The paved road from Mongu to Senanga is now in good condition. The only other paved road, Livingstone in Southern Province to Sesheke and the Katima Mulilo Bridge is in good condition as a result of being upgraded to link to the Trans–Caprivi Highway. The other roads in the province vary from a few good dry-season gravel roads such as Kaoma to Lukulu, to sandy or muddy tracks passable only by trucks and four-wheel drive vehicles. The Lozi are the major ethnic group in the province. The Lozi are traditionally cattle-keepers. They are a collection of 24 subgroups, with a well-established system of traditional rulers headed by the Litunga. The Litunga is assisted by subchiefs in Sesheke Senanga and Kalabo. The seasonal migrations of the Litunga and his court from the dry-season capital of Lealui, on the Zambezi flood-plain, to Limulunga, is an important cultural and now tourist event called the Kuomboka. There is an ethnic Nkoya minority centered on Kaoma (previously called Mankoya) district with their own chieftainship. The main traditional leaders of the Nkoya are Mwene (Chief) Mutondo and his equal counterpart, Mwene (Chief) Kahare all of Kaoma District and the surrounding areas. The Nkoya celebrate their annual traditional ceremony called the Kazanga or Kathanga between June and August in Kaoma District. Cattle are the mainstay of the traditional economy, and are sold in the population centres further east when money is required for cash goods or school or medical expenses. Crops are grown on the fertile Barotse floodplains and along the margin of the flood plain, in particular maize, rice, millet and vegetables. The sandy soils of the province are good for Cashew nuts plantations which are not being exploited this day. The province has a huge forest a high potential for timber cutting and finishing investment.The locals exploit the timber at a small scale for curios and canoe making. Logging for Zambian Teak, which grows wild in the south of the province, was important, and resulted in the construction of the longest private railway in southern Africa from Livingstone to Mulobezi, but this industry has declined due to the very slow rates of re-growth and the reduced demand for railway sleepers. There is no mining within the province, although there have been extensive exploration campaigns for diamonds and petroleum. The main tourist attractions are water sports and fishing on the Zambezi river, the annual Kuomboka ceremony and the annual Kazanga ceremony held in Kaoma District. ↑ Chris McIntyre (2004). "Getting There" in Zambia: The Bradt Travel Guide online at www.zambia-travel-guide.com. This page was last edited on 14 July 2016, at 16:44.